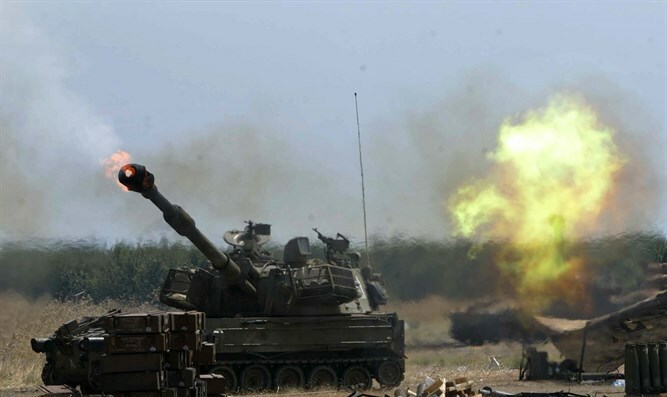 Terrorists cross Gaza border into Israel, prompting IDF to respond with artillery barrage. Terrorists operating from the Hamas-ruled Gaza Strip approached Israeli forces along the border with Gaza Sunday afternoon, prompting the IDF to launch an artillery barrage on terrorist positions in the Strip. The incident occurred after several armed terrorists on the Israel-Gaza frontier crossed the Gaza security fence and entered Israeli territory. In response, IDF forces fired at least seven artillery shells at the terrorists who had fired upon the Israeli unit. It is unclear if there were any casualties as a result of the Israeli artillery fire. Initial reports claimed that the terrorists had opened fire on an IDF engineering unit. The IDF confirmed reports by Gaza media outlets regarding the artillery fire, saying that the fire was directed at three terrorists, but denied claims that an IDF unit had come under fire. On March 30th, rioters kicked off the “March of Return” demonstrations, which drew tens of thousands in clashes with IDF forces along the border.